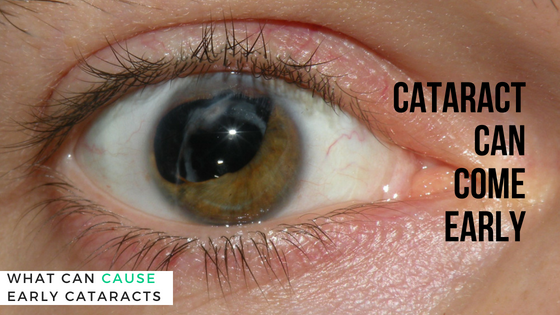 HomeLASIKWhat Can Cause Early Cataracts? A cataract is when the natural lense of eye becomes foggy, yellowed or cloudy leading to impaired vision. It can also cause significant loss of vision and even blindness, if not treated. Common symptoms of cataract are blurred vision, glare- sunlight or headlights may appear too bright, poor night vision, colors appear faded, double vision and frequent changes in prescription of your eyeglasses. Cataracts are considered early-onsets if they happen under the age of 60. Other than lungs, smoking impacts your eyes too. Smoking can cause a lot of eye problems and one of the major one is cataract. According to researchers, the chances of a smoker getting cataract are twice than non-smokers. Quit smoking for betterment of you vision and body. Any previous or recent eye injury because of an accident or otherwise is a significant cause for early cataract. Cataract caused because of an accident is called a traumatic cataract as it is developed because of a trauma caused to the eyes. UV rays deteriorate the lenses of our eyes. If you have a field job or are out in the sun most of the time without covering your eyes with sunglasses, then excessive exposure to sun/UV rays can also be a cause of early cataract. Avoid spending too much time in direct sunlight. If your close relatives have cataract, then your chances of developing a cataract are much higher than the ones who don’t have a family history in cataract. In case of family history and genetics, you must make sure to visit the eye doctor regularly, so that he/she can detect the early symptoms of cataract and treat you. Steroids are helpful for the people suffering from serious diseases like asthma, lupus, arthritis etc., but their prolonged and heavy dosage can have side effects that impact vision. There is a chance of early cataract because of steroids. Researchers have found out that some diseases impact the vision. Having diseases like diabetes, hypertension and obesity tag along with them the risk of cataract too. Prevention from cataract can be tricky as causes like diabetes, hypertension, obesity, genetic, steroid usage and family history cannot be avoided. However to prevent your eyes from UV rays you should make sure not to step out in sun without covering your eyes. Quitting smoking and limiting alcohol consumption is also a way to prevent cataract.